Get the most out of each brushing session with this Millers Forge Vista Shedding Slicker Brush. This brush has dual level pins which remove loose hair effectively for better results. It has long and short pins that work at two levels to remove mats and dead hair for better results with no extra effort. It even works on dogs with shedding problems! Brush features a super strong black handle. Soft foam-cushioned pad and curved head. Removes shedding hair without damaging topcoat. Provides a beautiful and long lasting well groomed finish. 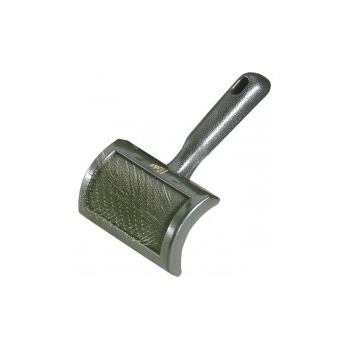 Millers Forge Slicker Brushes are available in the small, medium and large sizes.